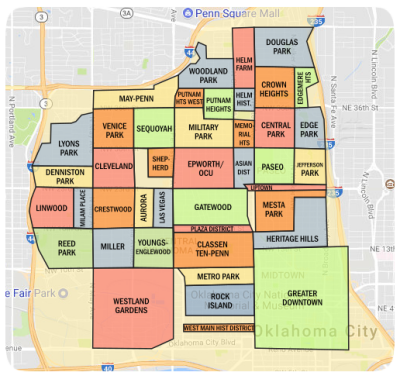 Oklahoma City is also home of beautiful and marvelous neighborhoods. One of the most sought-after one is Casa Bella. Casa Bella is an elegant and dazzling private community located on Britton Road and Coltrane one quarter mile east of Interstate 35. It offers homes with more or less one acre lots with a minimum of 2800 sq feet with beautiful trees surrounding the area. Residents of Casa Bella have easy access to I-35, I-44 and Kilpatrick turnpike allowing busy families get anywhere in the OKC Metro quickly. Residents with children are attracted to the top rated and award winning Oakdale school district located on Britton Rd. and Coltrane Rd. 1/4 mile east of I-35 where you will find state of the art facilities and a low student-teacher ratio. Schools servicing the area are Edmond Memorial High school, Oakdale Elementary, Oakdale Middle School, Oklahoma Christian School (Edmond), Heritage Hall, Casady School, St. Mary's School, University of Central Oklahoma and Oklahoma Christian University. 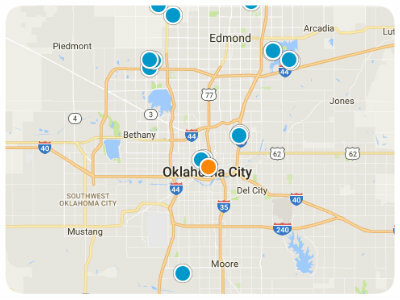 Available Utilities in the community are water serviced by City of Oklahoma, sewer serviced by Aerobic Septic Systems, electronic serviced by OG&E, gas serviced by ONG and cox cable are also available. First time home buyer or downsizing, Casa Bella is perfect for everyone. Don’t pass this one! Established on April 22, 1889 Oklahoma City is the largest city in the State of Oklahoma and is in the top five largest cities in the country in terms of geographic area. The City spreads into four counties: Oklahoma, Canadian, Cleveland and Pottawatomie. Oklahoma City is home to several professional sports teams, including the Oklahoma City Thunder of the National Basketball Association. The Thunder is the city's second "permanent" major professional sports franchise and is the third major-league team. The city also has treats for all tastes and budgets. Dine at Oklahoma City’s best restaurants such as Nonna's Euro-American Ristorante and Bar, where you can choose from private rooms to outdoor seats overlooking the heart of Bricktown. Nonna’s only offer the freshest of ingredients to make your experience a taste delight. Don’t forget to stop by Mickey Mantle's Steakhouse, a top spot frequented by celebrities, athletes, the business crowd and stylish locals. Other choices are Cafe 501, Bricktown Burgers, Big Truck Tacos, Bellini's Ristorante & Grill and the list just continues. Oklahoma City also offers other fun and exciting place for children of all ages and for the entire family. There’s Frontier City Theme Park, a western-themed amusement park with over fifty rides and attractions including four roller coasters, water rides, and shows featuring the Wild West Gunfighters Stunt Show with a wide variety of delicious food options. Another fun attraction here at Oklahoma City is the Bricktown Water Taxi, a great way to experience the beauty and grandeur of the Bricktown Canal where you can just sit, relax your feet, enjoy the beautiful sights while listening to an enjoyable history lesson as you float. Visitors and residents are guaranteed to find something to do here at of Oklahoma City.